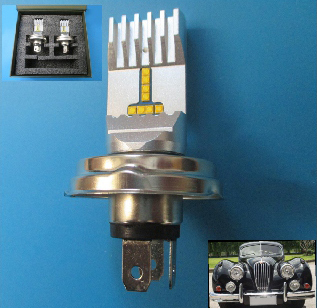 Many early cars used the large P45t (45mm flange, deep return, 3 connectors) in their headlights. These high power LED upgrades are the latest addition to our all-new classic LED headlight upgrade range. They use the new 4300K LED chips to produce more than double the light output of the original, but use only 15 watts on dipped and 25 watts on high beam. The colour of the light is not blue white, but ivory white, to look correct for the period. This is the first time that these headlights have been able to use LED technology without adaptors and the metal base comes from new tooling which produces an excellent fit, in difficult headlights like those on early Fiat 500, XK140/150 etc. Like all BCL products, they come with a money back guarantee. These also come with 5 yrs warranty against fault or failure. The price is for a pair of these new bulbs and does not include post, packaging or VAT if applicable.